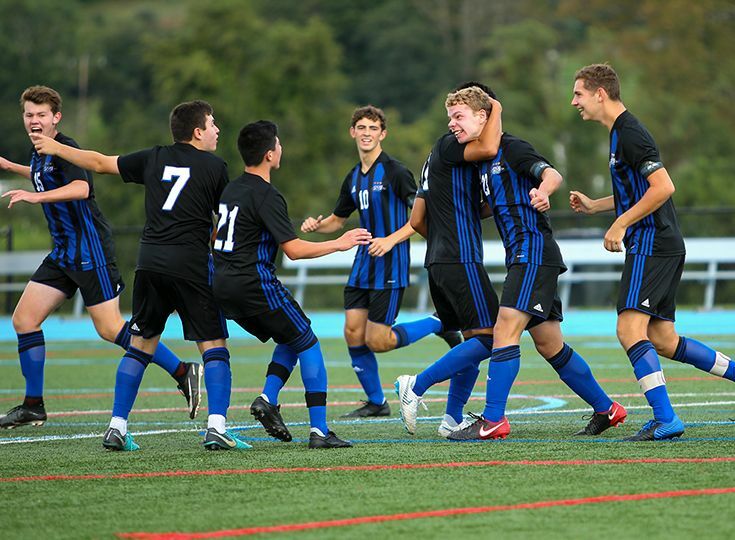 The boys’ soccer team defeated Hawthorne Christian Academy in the quarterfinals of the North, Non-Public B sectional championships on November 1 to advance to the semifinals. The Knights led the Defenders 1-0 at halftime and exploded for three more goals in the second half to put the game away with a final score of 4-1. Andrew Moglianesi ’19 got things started for Gill as he connected on a beautiful goal to put the Knights up 1-0 late in the first half. He picked up where he left off after halftime with another goal to make it 2-0. Micaah Garnette ’21 and John Baber ’19 also scored for Gill and Jacob Siegel ’20 contributed two assists. Alex Borto ‘22 had five saves in the win. Gill’s opponent in the semifinals will be top-seed Dwight-Englewood. The Bulldogs have had a strong season as they boast a 17-1-1 record and are currently the eighth-ranked non-public school in New Jersey. Despite being the lower seed, Bednarsky is confident in his group of players. The semifinal game will be played on Monday, November 5, at 2:00 p.m. at Dwight-Englewood. Good luck Knights!